FIU President Mark B. Rosenberg (left) stands with Miami FC co-owner Riccardo Silva (center) and FIU Executive Director of Sports and Entertainment Pete Garcia to announce the new name of FIU’s football stadium. FIU’s football stadium has a new name. FIU Athletics alongside Riccardo Silva announced the renaming of FIU Stadium, which will now be called Riccardo Silva Stadium, at a press conference April 3. 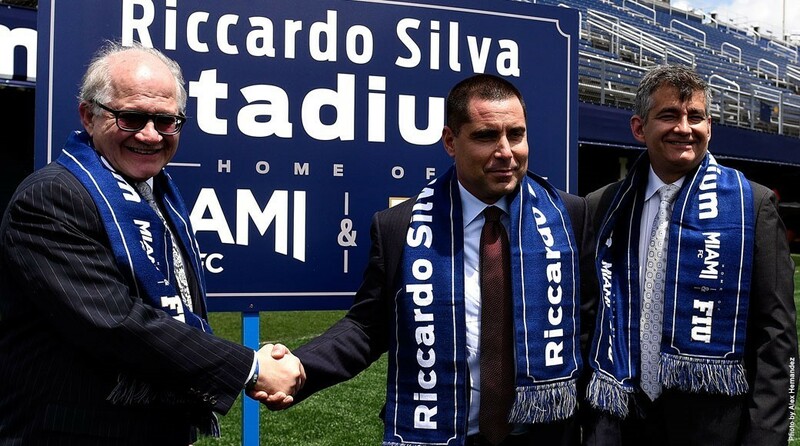 Silva, the owner of Silva International Investments and co-owner of professional soccer team Miami FC, has given significant financial support to the FIU Athletic Department since 2015. He is the 12th largest donor in FIU history and the largest donor in the history of FIU Athletics. His financial support helped usher in significant improvements to the stadium, including the installation of a new state-of-the-art playing surface and a new video board that replaced the existing scoreboard on the east side of the stadium. Silva’s Miami FC made its debut in the North American Soccer League (NASL) last year and will continue to play all of its home games at Riccardo Silva Stadium. Their first home game of the 2017 season will be played April 8 against the New York Cosmos, one night after the annual FIU Football Spring Game. For more information, go to FIUSports.com.